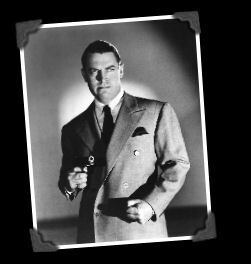 Boston Blackie, the private detective with sharp mind and pun-prone tongue, was originally created by author Jack Doyle. His early appearances were in magazine short stories and films of the early 20th century. He became a fixture in the golden age of radio starting in 1944 on NBC. The show was a hit with listeners and ran through 1950. The title character was most famously played by Chester Morris (pictured). Also featured were his romantic interest Mary Wesley (played by Lesley Woods) and clueless police inspector Farraday (Maurice Tarplin). Witty, well-scripted exchanges between Blackie and Farraday became a trademark of sorts, contributing considerably to the show's unwavering popularity. To listen without leaving this page, click the play button in front of a title; click again to pause. To listen via your browser's media player (with volume control, etc), click on the title itself.